Roosebeck 10 Inch Tabor Drum Goatskin Heads & Sticks. Red, white, and blue two-headed drum. Includes sticks. Two goat skin heads are mounted with wooden rings on a wooden frame with rope and tuning rings. The Red, White and Blue colors add to the Colonial feel of this drum. 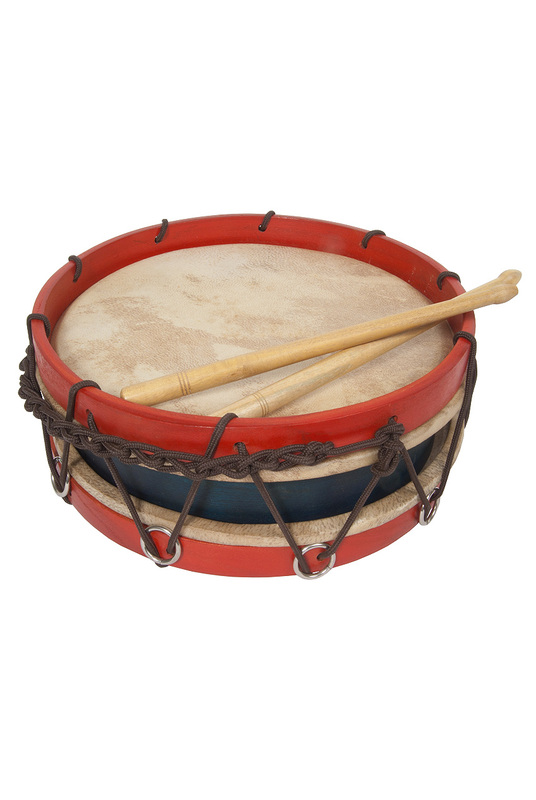 The English word "tabor" is derived from the Latin word for drum. Today we use the term tabor or refer to the two headed squat drums associated with the Fife and Drum. 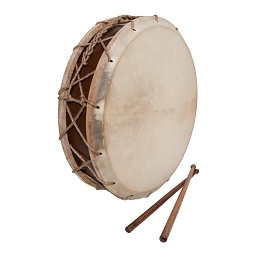 The thin shell of the tabor, looks like a frame drum shell with two heads. The shell is traditionally tin so the light weight instrument could be carried, and played, for long periods of time. Players usually hang the drum from the forearm while using one stick to strike the head. The tabor is suspended by a strap from the forearm, somewhere between the elbow and wrist. They should never be played on a drum stand; which would muffle the sound. Today Tabors have a variety of names that reflect the cultures that play them as well as the different sizes of drum.